My youngest decided to be Alice in Wonderland for Halloween. Rather than buy a new costume (we already have one, but it's too big for her), I decided to make her one. One that is not a glowing shade of fake material that you can't even wash when your kids get it dirty. A real dress. So I let her pick out material from my stash. 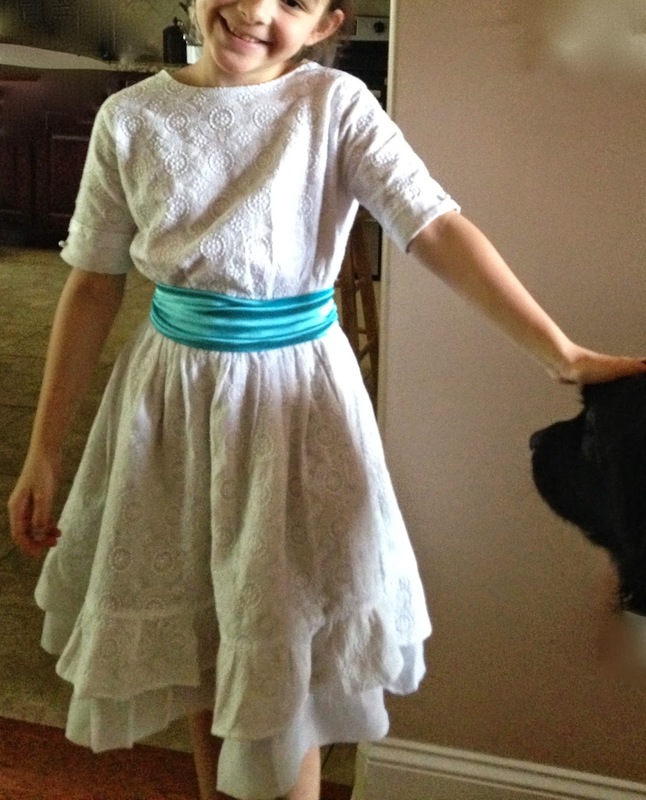 The fabric she chose was originally intended for a Cinderella dress for my oldest. But my mother never made it for her and I didn't know how to sew back then. But that's another story. I tried to take the easy way out and just buy the pattern at the store. As luck would have it, they were clean out. So I spent some time looking through those big catalogs trying to find something else that might work. I found a project runway dress. It has various pieces that you can mix and match. It was pretty easy to make, I must say. And then, since I had decided to make a separate pinafore (why would Alice have one already sewn on her anyways? Where's the fun in that?) I didn't have a pattern for one as impractical as the movie Alice's, or as historically inaccurate. I had to drag out some movie stills online for reference. Since the collar on the project runway dress is bigger than Alice in the movie's, I wound up making the neckline of the pinafore just a little wide. But I made it, all by myself. Without a pattern. Without a clue. Without attending to the packing I needed to be doing instead. And the birthday party planning. And as luck would have it, she wouldn't even wear the pinafore for Halloween anyways. What a waste. But it was ok, since we had this lovely white sweater for her to wear since it was kind of chilly. Then, like a miracle of God, she decided, once we moved, to wear the pinafore after all. She has gotten all kinds of things on it, like marker and chocolate milk and regular chocolate and strawberries. Even when the weather is in the teens, she will insist on wearing this outfit just because she wants to be like Alice. Which I guess is ok, since at least it's getting some use and not just sitting in the closet.